A day after making the pumpkin bread using my bread maker, I was intrigued to alter that recipe and replace pumpkin with potato. For all I know, potato buns or donuts always taste so nice, soft and sweet - so why not using potato for home-made bread? Actually, I was a bit gambling when I used potatoes for the bread because the textures of mashed potato and pumpkin puree are not the same. Mashed potato is way more starchy than pumpkin puree. To my surprise, the potato bread recipe that I used worked well and I had very nice and soft potato bread. The bread loaf looks so soft and fluffy like a cute pillow before I sliced it. It was so soft and fluffy I almost put my head on it and sleep. The bread looks so soft and fluffy, right? And here's the recipe that I used to come up with my yummy potato bread. Potato bread baking and looking tall. Double boil or heat fresh milk and condensed milk in a heat-resistant bowl until lukewarm. As per the general bread maker function: Place fresh milk, condensed milk, mashed potato, beaten egg, sugar and salt first in the bread maker. I haven't made any home-made white bread as yet so I can't compare its taste with potato bread nor tell which one tastes better as yet. However, I think I prefer the potato bread better than the pumpkin bread. Somehow, I found that the potato bread had softer texture and tastes better than the pumpkin bread - just a thought. I felt that the pumpkin bread was nice but potato bread was kind of nicer. All in all, the potato bread I made yesterday was so delicious that it tasted good when eaten plain, without any spread. Just a little update on my little girl's potty training efforts - I am happy to announced that she has passed the potty training (course) with flying colours and is now toilet trained! Naomi is pretty much a diaper-free toddler during the day and I make her wear her diaper only at around bed time, which is at 10-11pm. After about 2 weeks of continuous potty training regime at her school/day care and home, Naomi finally got the hang of it. One evening last week, she came home from day care and asked me to bring her to the toilet for peeing (xuxu) and when she was in the toilet, I let her sit in the toilet seat and she just did her business there. From then on, everything was easy. My husband and I already have one potty seat with very basic/standard design for Naomi. It was one of the compulsory baby items that we bought for our Chinese customary wedding ceremony years ago - part of the customs that hoped a baby would come into the newly weds' arms soon. However, Naomi didn't want to use this potty seat at all. Nevertheless, we decided not to buy another potty seat for Naomi (re: the cute one and of her preference) because we want to train her to do her business, straight in the toilet. For my husband and me, we didn't want Naomi to be attached to her cute potty seat and make her used to do her business conveniently like in the living room, bed room etc, because one day, we'd still have to train her to get used to the toilet (again) if we were to use this method. We prefer one-time work. To date, this go-straight-to-the-toilet method works fine. Naomi sometimes can climb the toilet seat by herself, without my or my husband's assistance. We wait her does her business until she finishes though. My husband and I practically don't bribe Naomi to make her do or not do certain things in our daily life. We don't want to turn Naomi into a creature of bribing habit. For potty training efforts - we do, however, reward Naomi with heaps of praises every time she passes urine or motion in the toilet. In the beginning, I followed other people's advice in forcing Naomi to go to toilet every 30 min or 1 hour. This trick didn't work and only created more in-house drama because Naomi just didn't want to go to the toilet if she didn't feel like to nor had no urge to pee/poop. When I forced her to go to the toilet at certain time intervals, she got angry and I, too, got frustrated when she refused to do this. And when she's angry, she tends to pee on her pants and then I would have to mop the floor. Learning from this experience, these days, I would just ask her if she wants to 'xuxu' or not. If she shakes her head, I take it as a 'no' and I'd just wait until she says 'xuxu' and goes to the toilet herself. I'd then follow her to the toilet. I guess things are now much easier when I take her lead on when to go or not to go to the loo. Last night, when we were on the way home, Naomi told us "xuxu". She happened not to wear any diaper last night and I didn't bring any in her bag either. Then, I told Naomi to hold on until we reach home as we were reaching home pretty soon. I think she understood what I said. Once we reached home, she went straight to the toilet and did her thing -- another progress! The only thing lacking now is that Naomi is still not able to differentiate pooping and peeing - she refers both as "xuxu". I need to ask her teachers how they say pooping in the school - just to make the learning effort consistent. In conclusion, potty training a toddler does take energy, patience and time - these ain't myths. Just persevere and be patient. Also, try to be consistent with your parenting or in this case, potty training, style that you think is best/comfortable for you and don't force your kiddo too much when it comes to toilet training. In addition, I think potty training doesn't have to be stressful, especially since each child is different. I have now learned my lesson. Haha. I thought when Naomi turned 2 years old something, like 2y3mo or 2y6mo, I could finally say goodbye to disposable diapers. But could I? No, Not really. My little critter ain't a baby no more. Actually I did try potty training Naomi for few times months ago - because, age wise, I thought she was ready. However, Naomi always refused going to the loo once every hour and every time I brought her to the toilet, she didn't want to take her pants off. She hated sitting on the plastic potty seat and back then, she couldn't even utter proper words to indicate poop or pee. When I made Naomi to go to the toilet to sit on the toilet seat, she cried, screamed, kicked and pulled my hair. There were just too much struggles for her toilet training efforts at that point. Naomi also left many scratches on my face just because Mommy wanted to make her go to the toilet. She made me feel that she was Wolverine and I was the villain who totally deserved relentless scratches here and there. After few tries, I gave up being her ultimate scratching target and concluded that she was not ready for toilet training as yet. Naomi is almost 2y9mo now and admittedly, she is still very much on her diapers. Every month, I still have to spend money buying two big packs of disposable diapers for her. Last month, I nudged Naomi's principal if the school could start potty training Naomi now as I noticed that Naomi can now say "xuxu" (baby language for 'pee' here) when her diaper was too full/heavy, she pooped on her diaper or her pants were wet which made her uncomfortable. Her teachers said they can start toilet training Naomi in June but we would have to start small. Baby steps first. June was finally here and beginning of this month, Naomi has started her potty training journey once more, with the help of her teachers at school. However, Naomi is kind of doing it 'part-time' now. Thus far, what the teachers have been doing is letting Naomi off her diapers from the afternoon until evening only. Slowly, they will work towards not giving her diapers any more from morning until evening or until when it's time to go home. I will then have to closely follow up this practice at home and try not to let my child wear diapers throughout the night as well - that's probably when Naomi can understand the urge/feeling to go, inform us that she needs to go to the loo and actually do her business there. Our challenges for the time being are that Naomi is still not able to feel the urge to go to the loo and only says "xuxu" after she peed on her pants. Every time her teachers ask her whether she wants to go "xuxu", she nods her head. However, when one of her teachers brings her to the toilet, she often doesn't pee at all and decides to pee somewhere else minutes later, when she is already not in the loo. In addition, at home, the toilet training process is harder because Naomi often doesn't want to listen to me, blatantly refuses to give me any response whenever I ask her if she wants to pee and struggles a lot when I try to bring her to the toilet every hour. Yesterday, Naomi managed to be a diaper free toddler for about 8 hours from afternoon until 8pm (what a record!). Between 6pm-8pm yesterday, she peed three times without informing me or her Dad. She peed in the living room, in the garden and in front of the fridge that I just cleaned. She only said "xuxu" when she felt her pants and floor were wet and with that, I had to change her underwear three times within 2 hours' time. By 8pm, I didn't want to mop her urine on the floor any more and called her potty training a day. I let her wear her diaper again. Toilet training is so tiring, frustrating at times and needs a lot of patience, man! Parents just have to be realistic that potty training is a challenging ordeal and does take time. Anyway, this time around, I have more confidence in potty training Naomi - maybe because her teachers are also devoting their time to potty train her. In this regard, I sort of get some supports in this matter and am actually less nervous with the whole training process. I am not sure how long Naomi will take to make her full transition from diaper to underpants but I heard potty training may easily take months? Anyhow, potty training is an inevitable rite of passage for parents and the child - so let's just do it, when the kid is ready. Sooner or later, Naomi will have to let go her diapers anyway. Naomi's play school has this Parent Involvement Activity program where students' parents (usually the mothers since dads are busy working) are encouraged to teach some activities to the kids for 30 mins at the school. 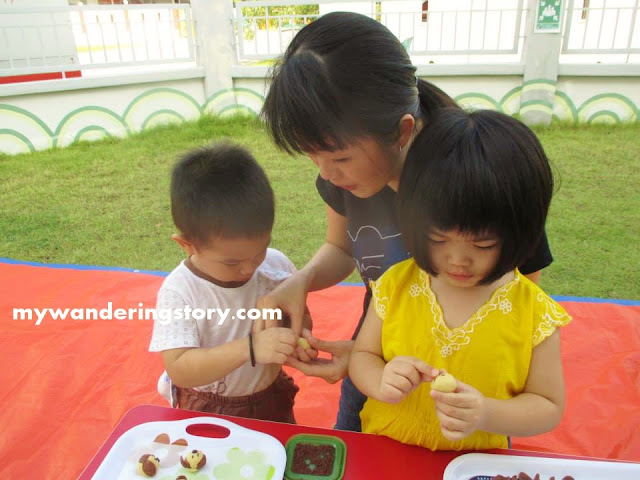 The activities are up to the parents - they can be cooking, storytelling, crafting, cupcake decorating, etc. Few weeks back, I was handed a form to fill if I were to participate at this activity. Initially I was hesitated whether I should take this opportunity up or not because one of my biggest fears in life is actually public speaking. If I were to teach the kids, that means I would have to speak in front of more than 15 kids and 5 adults/teachers. 20 people = public to me. I was nervous but couldn't stop thinking about this for days. As I felt that this teaching activity is an opportunity I should not miss; last week, I confirmed my participation to teach the kids with Naomi's principal. After contemplating on some ideas of the activity that I wanted to teach to the kids, I finally chose the subject that I think I master best - making cookies. In particular, making dog cookies as I've done this more than five times by now and it's a fun activity for the kids because the cookies' shape is so cute and it mimics the animal that they are familiar with. All the activity materials must be prepared beforehand and on my own. This said, last Saturday, I was already busy baking the dog shaped cookies for the kids. The idea is that I wanted to let the kids taste the dog shaped cookies that they were making at the end of the class. I was supposed to teach the kids at 9.30am today. Last night I was not able to sleep well and kept on having bad weird dreams like I didn't make it on time to the class, experienced multiple failures in making the cookies dough for the teaching material in the morning, had to remake the cookie dough twice and my husband had to teach the class because I came late to the school and so on. I had this series of nightmares that specifically involved making dog cookie dough. I reckoned I had much interrupted sleep last night because I was too anxious with the final preparation of today's class. God, how I took all this so seriously! I didn't make the cookie dough yesterday because I worried the cookie dough wouldn't look so nice if it's kept overnight in the fridge. That's why, I decided to make the cookie dough for the kids to experiment with early this morning. Generally not a morning person, I woke up when the sky was still dark, even before the alarm that I set rang, to take the butter out from the fridge and let it sit for one hour to reach the room temperature before I could do anything with it. At 7.30 am, I began making the cookie dough and one hour later, I finished rolling the cookie dough into mini balls. Considering the kids' age and time constraint, I would just ask the kids to decorate the cookies with chocolate rice, chocolate chips and koko krunch to make the cookies look like dogs. I arrived to Naomi's school at around 9 something this morning. 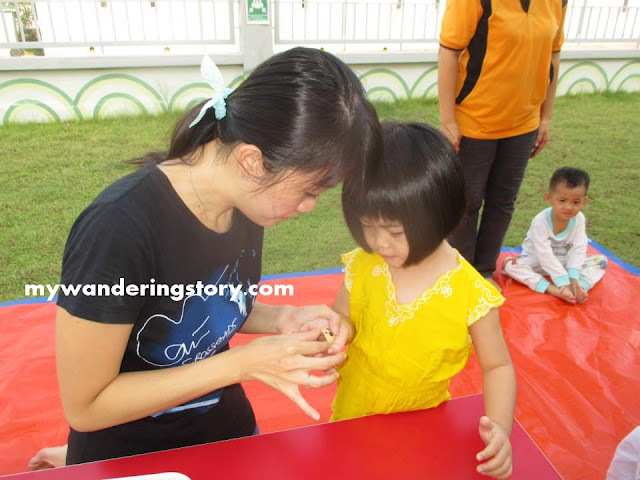 Once the kids had their routine circle time, the teachers had them wash their hands before heading to the outdoor class where the cookies making workshop with Naomi's Mommy was going to be held. After Naomi's teacher asked me to take over the stage lawn, the cookies making class was officially started. I've actually asked my husband to print some baking ingredients and oven pictures to show the kids some visuals or the story of baking cookies. Nevertheless, I was so unsure if a story like this would draw the toddlers' interests. Since I was not confident enough with this idea, I cancelled this plan and wasted all the colour printed images. The outdoor class set up. Before I began the hands-on cookie making or decorating experience, I showed the kids the dog cookie that I already decorated and asked them to guess the shape of the cookies that we were making today. One of the kids said that we were going to make bear cookies. Then, some guessed the shape of the cookies were dog and cat. Then, one kid changed the topic and began telling the story of a cat and dog that I barely understood. Brief introduction about dog cookies. Anyway, I kept my introduction very briefly. Moving on, I showed the kids how to place the eyes, nose and ears of the dog to the cookie ball. Next, I asked one kid to get up and stand next to me so I could teach him how to make the dog cookie. My second student today was my own daughter. The one-to-one cookie making class continued for the next 20-25 minutes or so. 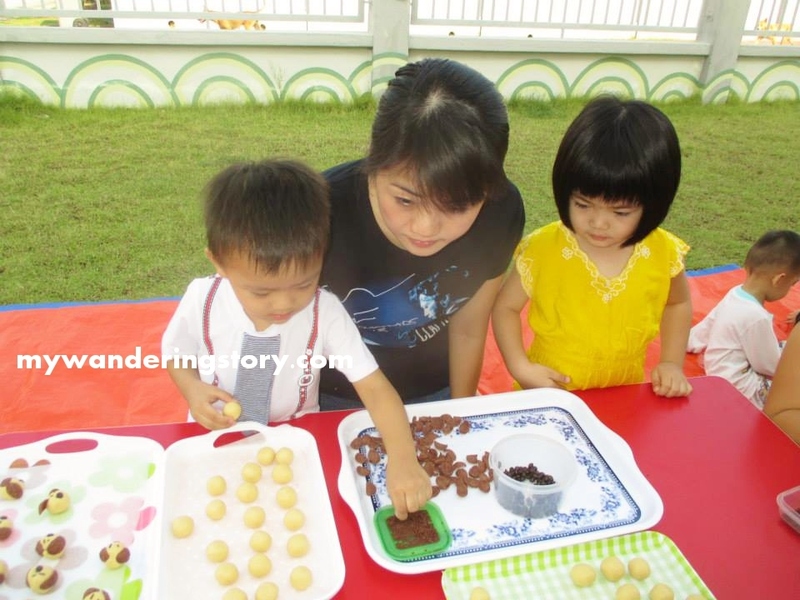 One-to-One hands on cookie making workshop with toddlers. Naomi's principal helped me teach some of kids how to make the dog cookies individually so each kid had the chance to make at least 1 cookie within the 30 minutes' time frame. Each of the kids had their chance to make the dog cookie once but some managed to do it twice. Naomi had the most chances because she kept hovering around me while I was teaching her friends and loved decorating the cookie balls into dog shape on her own. Maybe she thought we were having some play dough time with chocolates. Teaching Naomi how to make the dog cookie. I ended the class by asking kids to take the dog cookie that I baked during the weekend from me. Some kids ate one cookie, some ate more than one and my daughter didn't want to eat any of the cookies at all. So ironic, isn't it? Naomi was still very busy making more dog cookies whist all of her friends were chillax-ing on the grass and eating the cookies. My assistant was always next to me when I did my first teaching gig. The below picture shows the dog cookies that my one-off students made this morning. Some of them did really well in decorating the cookie without pressing the cookie ball too roughly. 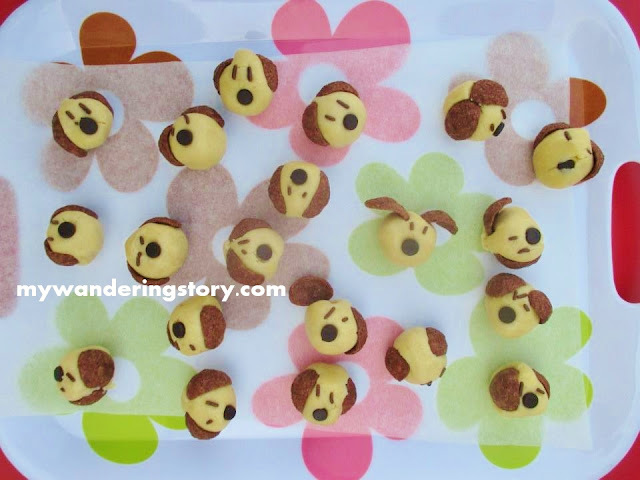 Some pressed the cookie balls too hard and made the dog cookies look very distorted. One kid gave three eyes to the dog cookie and one of the teachers said that the dog cookie that Naomi's friend created is a mutated dog. The cookies that my students made today. Thanks, Naomi's teachers - for the teaching opportunity earlier today.